Greetings Empire Avenue! We have just opened the ability for you to purchase Premium Accounts! You might have seen changes throughout the site in the past two days as we prepared to launch. In this blog I wanted to highlight the benefits that you will gain by utilizing a Premium Account and any unique features that come with it. Not to mention the value you gain compared to purchasing some of these upgrades and Eaves individually. Please note that your Standard Account is of great value and remains unchanged. Premium Accounts are a way to take your Empire Avenue experience to the next level. One of the first benefits of having a Premium Account is an additional influx of daily Eaves. Depending on your Premium Account tier, we will give you extra Eaves every day on top of any regular earnings through the Stock Market game (Dividends, Share Sales) or from completing Missions! Eaves are used throughout Empire Avenue. Use the Eaves to make more daily investments, run more Missions, and buy upgrades in the Empire Avenue shop. Premium Account holders are also given access to our partner, Avenue.io. Avenue.io allows you to have enhanced control over your investments in the Stock Market game. For those who manage a personal and a Business/Brand account on Empire Avenue, Avenue.io allows easy maintenance of multiple accounts in the Stock Market game. Analytics enhancements for every Profile is starting to be rolled out with this release. With this release of Premium Accounts you will also be given additional data regarding who has viewed your Profile. Like LinkedIn, this will help you to know who exactly on Empire Avenue is interested in you, and make connecting with these interested individuals much easier. All accounts (Standard and Premium) can now see the number of Profile Views in your Evaluate section and those with Premium at the Silver level and up can view who viewed you. Creating Missions on Empire Avenue is a great way to gain new eyes, or interest for your content, business, or your personal brand and more. Premium Accounts will make the power of Missions even greater. With this release we are releasing Impressions and Click data on your Missions Dashboard for Premium Accounts. All Premium Accounts will have access to the Impressions generated on Empire Avenue pages for your Missions as well as the number of Clicks that those Impressions generated. For Gold Premium Accounts, you will be able to access graphs and for Platinum Premium Accounts, you’ll be able to see the unique views, who viewed but didn’t take it and so on. What this means for you is that you will be able to see exactly which type of Mission content is providing you with the most engagement and when. All the Premium Accounts have commission fee reductions from the Standard 100% which allows your Eaves to go further. The Social Stock Market receives a few upgrades, including expanding upon the long-standing limit of 5,000 profiles you could earn Dividends from on a daily basis. All Premium Accounts will also be given additional Even More Dessert packs (also available for purchase as standalone items in the Empire Avenue Shop). These bonuses will allow you to purchase even more shares in your favorite profiles and not have to buy individual packs! We are working on upgrades to both Standard and Premium Accounts. If you purchase a Premium Account now, we will not charge any extra for additions to your tier level as we roll updates out. We will inform you via email and through Empire Avenue as we make changes, updates and additions. Some of what we hope to release for the Fall includes, Refined Mission Targeting, Premium Communities, Account Verification. 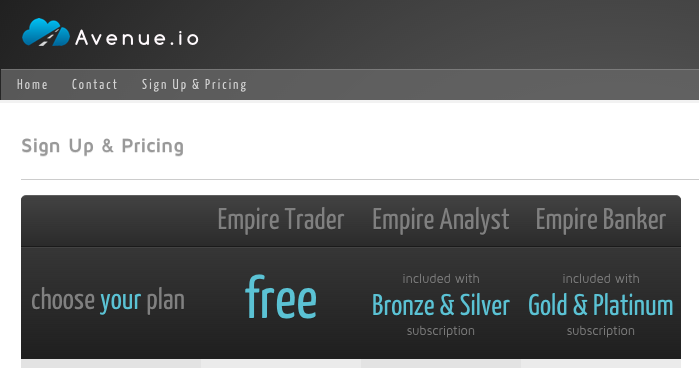 We have released these Premium Accounts with a 20% discount for three months for current members of Empire Avenue. If your Empire Avenue account is created before August 16th, midnight UTC, we will give you an automatic discount as long as you enrol for a Premium Account by August 31st. We have updated the Frequently Asked Questions pages and the Shop Help to reflect these new Premium Accounts. If you have questions please let us know through Support or through Empire Avenue General Discussion.